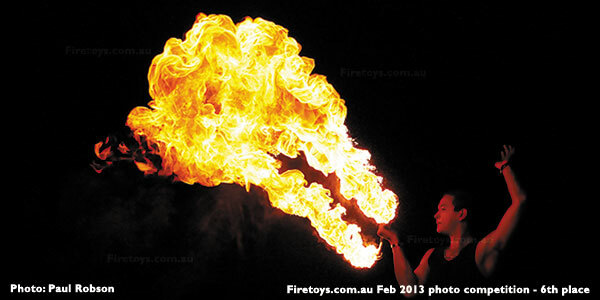 Firetoys stocks Australia's largest range of fire twirling gear! A total of 7731 products available in 690 categories. With 3 photo, 1 video, and 1 text competition open, and a prize pool of nearly $2000, everyone can win free gear! Firetoys now sells Gora fire gear! Dragon staffs, fire cross sticks, folding fire fans, fire umbrellas, fire hats, fire skirts, and lots more. Now stocking - Kosmos LED range. Devil sticks, staffs, clubs, and balls. Over 3500 different poi sets! From tiny 25mm tube cores up to huge snakes (as pictured). Most in-stock and ready to post same day. Over 270 different fire staffs available! That's Australia's largest range! Simple and basic to absurdly impressive. 6 days of fire twirling fun just outside of Melbourne.